People, especially when they are young and technologically-minded, desire ‘seamless connectivity’ to access information…Modern scanners will be increasingly used for copying. Walk-up Patron Scanning Use For Libraries, Universities, County Clerk Offices and More! With its compact tabletop design, unique overhead scanning system and touchscreen panel, the Zeutschel zeta book copy and scan system is ideal for on-demand patron digitization of bound books, loose-leaf documents, binders, maps and more up to A3+ sizes. The ODS overhead document scanner is designed to scan documents, bound books, spiral notebooks, lab books, binders, photographs and other flat or bound media up to A2 size with a high definition 18MP CMOS sensor. The next generation of Zeutschel book copy system utilizes specifically engineered overhead capture technology, touchscreen accessibility and easy-to-use software to create an ideal unit for walk-up patron users. The Zeutschel Chrome is optimal for scanning documents up to A2 size, including bound books, loose-leaf materials, binders and more. The compact 18MP UScan+ UF-Series Universal Film Scanners allows walk-up users to quickly and easily print, scan and save images from all types of microform, including: microfilm; microfiche; jumbo fiche; aperture cards; micro-cards and photographic materials. In response to client interest and requests for on-demand scanning options, The Crowley Company offers a range of models specifically designed for walk-up patron use. All systems are ILL-compatible and can easily be fitted with pay-per-use systems such as those offered by Pharos and other vendors. 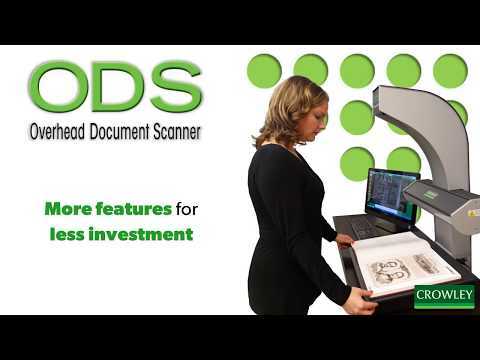 Libraries, universities, county clerk offices and others are finding these affordable and easy-to-operate book and microform scan systems ideal for archivists, researchers, faculty and everyday citizens.